Apples, apples, everywhere - one of the joys of fall. While apple pie, apple crisp, apple muffins, and apple sauce are certainly divine, sometimes a break is necessary between cozy fall treats. Apples shine in this healthy salad recipe that is also refreshing and bright, a lovely naturally gluten-free side dish for any occasion. 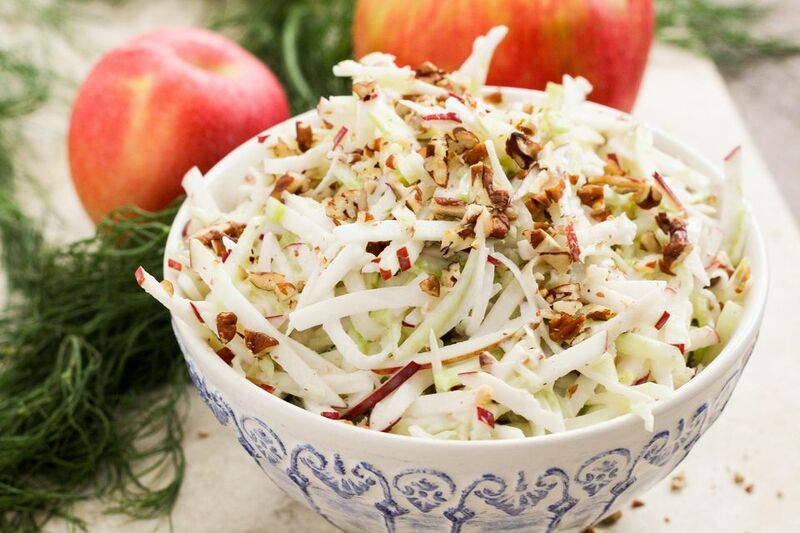 Cortland apples, with their juicy tart sweetness, pure white flesh, and ruby red skin work especially well in this slaw. Cortlands are also slow to brown when sliced and exposed to the air, so the salad maintains a stunning brightness. Gala and Empire apples are also varieties delicious raw and slow to brown and can be used in place of Cortlands (you could really use any apple you prefer, these are simply recommendations). Fennel is a vegetable that peaks in the fall and bears a slight anise - or licorice - aroma and flavor. This anise flavor pairs well with the tart and sweet essence of the apples. Both are crisp and refreshing and come together in a fall salad that's crunchy and light. The apples and fennel bulb are sliced matchstick thin with a mandoline slicer (or julienne peeler) then tossed with a creamy, yet healthy dressing of non-fat Greek yogurt and honey. Tangy with a hint of sweetness that balances the other tart, sweet, anise flavors, this fall salad is delicious as a fall side dish or for a special occasion such as Thanksgiving. Wash apples and trim off both ends. Slice in half and run each apple smooth side down along a mandoline to slice into matchsticks. The seeds will fall out in the process. Alternatively, you can slice into matchsticks with a sharp knife or julienne peeler. Trim both ends of the fennel bulb and discard. Slice in half and remove the tough inner core, which looks like a white triangle starting from the base and extending up to the center of the bulb. Run each fennel half smooth side down on a mandoline to thinly slice (it's okay if they don't come out equal size like the apples). You can also thinly slice with a sharp knife or julienne peeler. Combine the apple and fennel slices together in a medium-size mixing bowl along with half the chopped pecans. In a small separate bowl, whisk the Greek yogurt and honey together. Pour over the apple and fennel and toss to coat. Garnish with remaining pecans and serve immediately. Or, cover and chill, garnishing with pecans prior to serving.